Here are a few more details on the Barron Family, who started the cannery at Funter Bay. 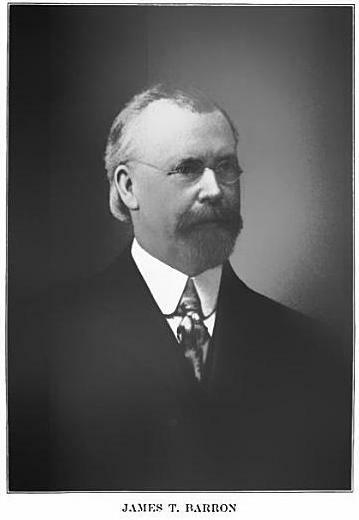 James T Barron attended St. Mary’s and Santa Clara colleges, then worked as an accountant (with sidelines in beekeeping) until becoming secretary of the Hibernia Savings Bank in 1893. In 1899 he started the Thlinket Packing Co. He quickly sold his first two canneries to finance the new cannery at Funter Bay in 1902, but then bought back some of the interest in the earlier canneries when they went bankrupt (mentioned previously). He remained involved in the Hibernia Savings bank. He was described as a member of various professional and social clubs and organizations around Portland. J.T. Barron married Elizabeth Nixon in 1890. Her parents were Robert Nixon and Anna (Hogan) Nixon, both natives of Ireland. Robert Nixon was killed during the Civil War while serving in New Hampshire’s volunteer regiment. James and Elizabeth seem to have had a comfortable household in Portland, living at 634 Wasco St (near downtown). They were occasionally mentioned in the local paper for such notable things as parties and car ownership, and they could apparently afford two maids in 1916. James and Elizabeth’s children were Robert J. Barron (1896-1917), Anna Maria Barron (b 1894), and Agnes Elizabeth Barron (1897-1898). Both Robert and Anna had cannery boats named after them. As previously mentioned, Robert Barron entered the Army Aviation Training Corps on June 3rd, 1917. At Age 22 he had already become Vice President of the Thlinket Packing Co under his father. Shortly after his enlistment, on August 21 or 22 (records conflict) of that year, Robert was killed while attempting to save fellow cadets from an aircraft accident. During landing practice near Chandler Field, two cadets had been thrown from a Hydroplane (an early type of floatplane) into the rough water of the Delaware River (ref). Robert attempted to swim to their aid, but was overcome by the current and drowned. He was applauded as a hero and given a full military funeral of a ranking officer. Everman Field at Fort Worth Texas was renamed “Barron Field”, and the mountain above Funter Bay in Alaska was named Mount Robert Barron in his honor. Woodrow Wilson sent a letter of condolence to James and Elizabeth. Anna Barron married Thomas Martin Fitzpatrick (1882-1948) in 1914, and had 5 children including James Barron Fitzpatrick (1916-1992), Adrian Thomas Fitzpatrick(1926-1977), and Robert Barron Fitzpatrick (1921-1979). 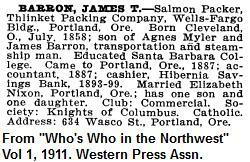 James Barron Fitzpatrick seems to have been the chairman of the Portland City club in 1952. He was married to Elizabeth Rae Lansworth (1924-1988) and had 9 children. Here is J.T. Barron’s gravestone. and Elizabeth Barron’s. I ran out of steam on tracking the Barron family farther, this became one of those recursive research topics where one thing leads to another, and suddenly I have half the family history of someone who was previously just a name. If I happen across more information I’ll see about updating this. This entry was posted on Friday, April 26th, 2013 at 6:38 pm and is filed under Funter Bay History, Funter Bay People. You can follow any responses to this entry through the RSS 2.0 feed. You can leave a response, or trackback from your own site.